Portorose (Portoroz) is the main Slovenian sea resort; it has been the sea in fact, together with the Mediterranean climate and salt-works, to make of it a tourist destination adapted to all seasons. The natural healing factors, like the mud from the salt-works and the sea water, were in fact used, according to the tradition, already by the roman soldiers and in XIIth century by the Benedictines of the monastery of S. Lorenz. The thermal station began to develop in 1885 when it was constructed a small hotel and a building in which talassoterapia was practiced. Today the “Bay of Roses” is the most renowned tourist locality of the Slovenian coast, thanks to the elevated quality of the hotel offer, to the rich cultural and congressional activities and to the varied possibilities of entertainment, the first being the Casino. Portorose is a well known Slovenian tourist resort on the Adriatic coast, famous for its sunny position in the bay of Piran, which is protected from wind amidst subtropical gardens, olive groves and vineyards. The Portorose Riviera attracts many guests for its mild climate, sandy and rocky beaches, natural medicine remedies and long-standing tourist tradition. Portorose is the starting point for a variety of trips: one can leisurely walk to the medieval town Piran, the birthplace of the violinist Giuseppe Tartini, or take a half-day trip to the world famous underground caves of Postojna in the Karst region, or to the original stable of the Lipizzaner horses; take a whole-day trip to lake Bled, the Alpine resort with an island in the middle of its lake. Portorose is also renowned as a congress site with high-quality congress facilities. 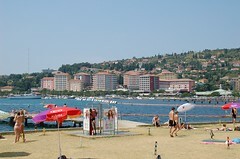 Portorose is now known for many high class hotels, spas, live casino, and a marina. The Grand Hotel Bernardin is the biggest convention centre in Slovenia. This high quality hotel overlooking the sea provides noteworthy tourist services. The hotels are located in a quiet and natural environment. Completely air – conditioned hotel has 242 comfortably furnished rooms with balconies and sea view, of which 10 luxury apartments, 22 junior suites and 8 high standard rooms. The LifeClass hotel chain distinguishes itself by featuring excellent four- and five-star hotels. The Mediterranean character is deeply woven into the fabric of the LifeClass hospitality and it embraces with arms and heart open each and every guest from whatever part of the continent he/she may come. 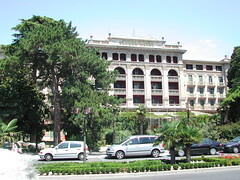 If you happen to be in Portoroz, the choices are many: the Grand Hotel Palace, an exclusive five-star hotel, or high category four-star hotels Slovenija, Riviera, Apollo, Mirna and Neptun. 98 rooms, 5 junior suites, 1 presidential suite, air-conditioned rooms with large balcony, luxurious bathrooms, direct dial telephone, mini bar, satellite TV, 24 hour room service, luxurious reception with lobby bar and terrace, restaurants Grand Salon and San Lorenzo, Acqua Relax Centre (wellness), Physio-Esthetic Center, Congress Centre – 5 conference rooms, Night Club, Casino’, underground parking facility, all rooms completely renovated in 1996.